The Chosen Knights by Mary Ting is an urban fantasy lover’s dream! There are demons, vampires, angels, and fallen angels all set to the back drop of high school in Hawaii. What more could you ask for?! If you are new to Mary Ting, I highly recommend reading either The Angel Knights, the prequel which will give you a little background to the world created by the author, or go back to the beginning Crossroads, the series that this one is based off. Personally I haven’t read Crossroads and am not lost so this series can be read as a standalone. However I have every intention of reading them! 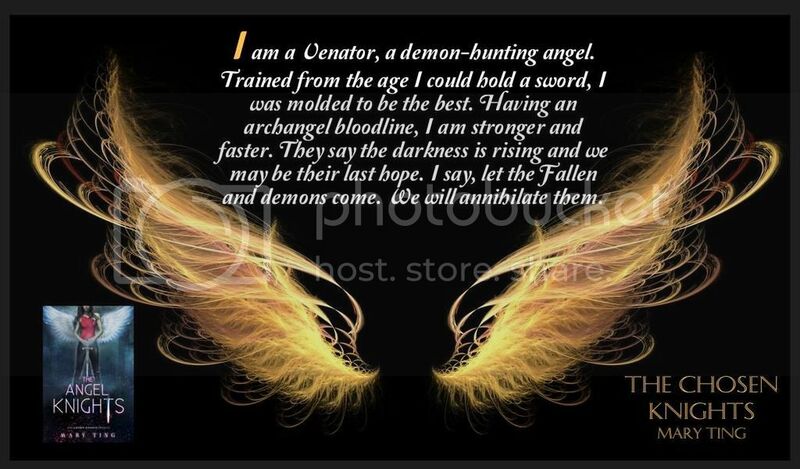 Lucia and Zachary are the nephilim children of Michael and Claudia, raised to be demon-hunters, Venators. They deny the human-side of themselves, pushing their emotions to the side. Zac does this better than Lucia. Lucia struggles and it’s this struggle that drew me to her story. Lucia and Zac are 17, have never been around humans, and are now being thrust into the world of high school. It’s interesting to read how they adjust and even humorous when Lucia tries to reason out the use of unfamiliar slang which results in miscommunication. Lucia is easily likable. She’s loyal, a fierce fighter, and follows her heart, which gets her into a lot of trouble. Zac is what every brother should be. He’s her best friend, her confidante, and always has her back. “Uncle” Davin, Michael’s best friend and their guardian while in Hawaii, cracks me up. He’s like a big kid, but fiercely protective of Zac and Lucia. I love him! Then there’s the humans they meet, or at least Lucia believes them human. Eli is half-demon and also the love interest. I’ll be honest, I really had a hard time liking him. He’s rude, pushes Lucia away at one instance and in the next is keeping a close eye on her. I’m not sure how I stand on my feelings for him. The plot revolves around the mysterious Cyrus, who he is and what he wants. I found myself completely absorbed in the paranormal world created by Mary Ting. Between the mythology created by the author and the action, I was hooked! I loved the scenes between Eli and Lucia. You never really know where either stands. Are they enemies, are they friends, or are they more? And that ending….ugh!!! I hate cliffhangers. I need The Blessed Knights like yesterday. Overall I really enjoyed this book! It’s a great start to the series. If you enjoy urban fantasy, paranormal romance, or enjoyed the Crossroads series, I highly recommend grabbing a copy of this book asap. Thanks for letting me know! When I get home I’ll research it. The site has been glitchy since the last WordPress update ?